The Maldives faces a political crisis as elected President Mohamed Nasheed resigns. Was it a coup? The Maldives was plunged into a political crisis on Tuesday when the first democratically elected president, Mohamed Nasheed, was forced to resign after weeks of protests that culminated in open clashes between the police and army on the streets of the capital, Males. “I resign because I am not a person who wishes to rule with the use of power,” the president said in a televised address. “I believe that if the government were to remain in power, it would require the use of force, which would harm many citizens.” Later in the day his deputy, Muhammad Waheed Hassan, was sworn in as the new president of the archipelago. Nasheed came to power in 2008 when he defeated Maumoon Abdul Gayoom, who had run the country for thirty years, during a run-off vote in the country’s first multiparty elections. 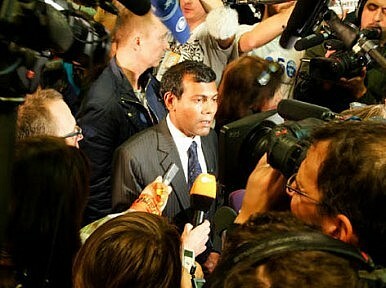 Nasheed, who had at one time been a political prisoner, ran on a platform of democratic change and environmentalism. The chain of events leading to Nasheed’s resignation began when the president ordered the arrest of the country’s Chief Criminal Judge Abdulla Mohamed. Mohamed has long been accused of various wrongdoings including misogyny, sexual deviance and, in one instance, throwing out an assault case even though the defendant confessed. The government only took action against Mohamed, however, after he ordered the release of two figures of the DQP opposition party: Deputy Leader Dr. Mohamed Jameel and Council Member Sandhaanu Didi. The two men had recently publically accused the president of conniving with Christians and Jews and encouraging vice around the country. They were unable to substantiate their claims when they were later confronted by security forces and taken into custody. After Mohamed ordered their release, President Nasheed accused him of being in former President Gayoom’s pocket and ordered the military to arrest the judge. Mohamed’s arrested sparked widespread protests by pro-Islamic parties led by former President Gayoom. According to news reports, the protests erupted Monday night when police began mutinying and, along with the supporters of Gayoom, burnt the main rallying point of Nasheed’s Maldives Democratic Party (MDP). They then seized the state broadcaster MNBC and promptly renamed it TV Maldives, as it had been called during Gayoom’s rule. The new president has, however, disputed this interpretation of the events and said there was no pre-arranged plan for him to take over. “We will respect the rule of law, we will uphold the constitution, the executive will not interfere in legislation and we will make sure that democracy is consolidated,” the BBC quoted him as saying at a news conference on Wednesday. In any case, Nasheed was a moderate, democratic force in Maldives. As such, his removal threatens to usher in the revival of two worrying forces: radical Islam and autocratic rule. Radical Islam has been on the rise in the Maldives since 1997, when Gayoom declared that Islam was the state religion and restricted the freedoms of non-Islamic believers. Since taking office, Nasheed had tried to curb the rising influence radical Islamic groups. However, they have continued to loom over the country’s politics and have demonstrated an ability to appeal to religious sentiment in order to whip up public opinion against the government and other secular forces in society. What has happened in Maldives is the antithesis of the Arab Spring. In much of the Arab world, the masses are struggling to overthrow autocrats and establish democracy in their place. In contrast, democracy in Maldives is at risk of being hijacked by reactionary groups who oppose the democratization of the government. As the unrest in the Maldives continues, India vows to play a big role in helping the political transition.